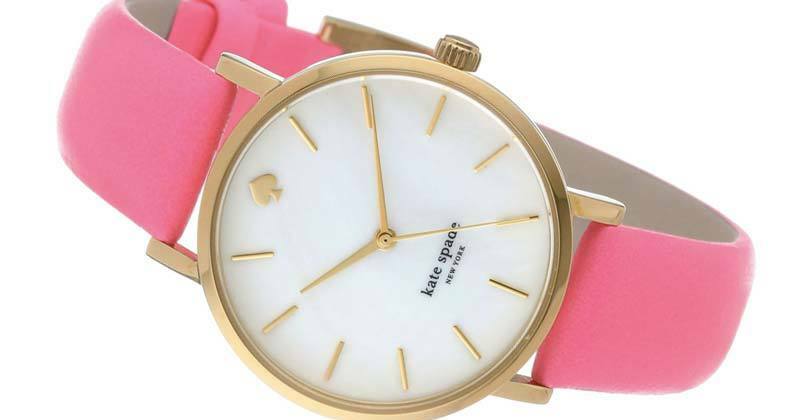 The Kate Spade Metro Mother of Pearl Dial Leather Womens Watch features a gold-tone stainless steel case with a bazooka pink (pigskin) leather strap and a fixed gold-tone bezel. The watch features gold-toned hands and index hour markers with the Kate Spade logo at the 12 o’clock position. The watch boasts an analog quartz movement system, scratch resistant mineral crystal front glass in solid case back 34 mm in diameter. Buy this Kate Spade ladies watch, click here! Kate Spade Womens Bazooka Pink Watch : Kate Spade Watches 0 out of 5 based on 0 ratings. 0 user reviews.